Arabic music, a term that refers to music from Arab-speaking countries, is a richly layered musical tradition that spans centuries of history across many regions, from the Mahgrib region of North Africa to the Near East, and it continues to evolve and weave itself into modern music genres. 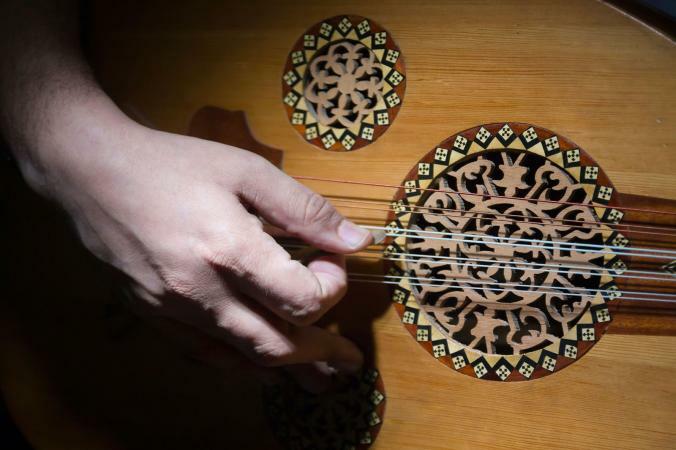 The music has its roots in centuries past before Islam swept across the region. The Muslims who conquered called the pre-Islamic musical period the time of Jahiliyyah or "ignorance." Though the music was seen as primitive, the roots of pre-Islamic Arab music go deep into a rich, multi-layered soil of civilizations, such as Persia, Mesopotamia, and ancient North Africa. When Islam spread, however, and as rulers brought musicians and composers into their courts, the music took on a far more complex and refined form, backed by highly scholarly work in the field of music theory. According to Habib Hassan Touma's book, The Music of the Arabs: "[The music] evolved from its pre-Islamic period and developed further during the Islamic era and crystalized in the schools of Mecca, Medina, Baghdad, and Cordoba. From the thirteenth century on, other centers of musical activity sprang up." These centers spread across all of North Africa and the Near East. The music is predominantly vocal, and it demands a higher level of vocal perfection than what Western audiences demand. Singers must have perfect intonation, be able to sing modes that use ultra-precise microtones, and even pop singers are expected to perform at the level of classically trained vocalists. 1. A tone system with specific interval structures called a "maqam" scale. Using this scale, performers engage in what Touma calls the "maqam phenomenon," in which the performer improvises heavily on the chosen maqam mode. 2. Complex rhythmic patterns with long, intricate phrase of rhythm values that support the singer or performer. 4. Different social contexts for the creation of music that Arabs would categorize as urban music for city dwellers, rural music for country inhabitants, and Bedouin music for desert dwellers. As Touma observes: "...consider the Bedouin who, by virtue of mass media, can listen to any kind of music in his desert tent but who would never make music himself outside of a specific context." 5. A common musical mentality, despite the wide variety of Arab nations, that produces an aesthetic homogeneity in all sub-genres of Arabic music, whether they are composed, improvised, instrumental, vocal, secular or sacred. The rich variety of the music can provide for hours of listening pleasure. These popular genres, though certainly unique, show the common Arabic musical mentality that threads through every style. Arabic classical music, though very diverse, had certain things in common: small to medium-sized ensembles performed the music, and the ensembles played instrumental pieces, as seen in the first example, but they often provided accompaniment to an Arabic classical singer, similar to a western orchestra accompanying a western opera singer. The chamber ensemble sound shares similarities to western chamber music of the Baroque period and other earlier classical music genres. You can dowload mp3s of instrumental classical Arabic music on the instrumental page of MaqanMP3. The following video demonstrates vocal classical music. The orchestra establishes the rhythm, scale and melody of the song first, and then the singer performs with ultra-precise intonation and expressive flourishes, often sliding up and down to microtones that mainstream western music does not contain. This particular example features Umm Kulthum, the biggest star of classical Arab singing in modern history and a globally renown musical legend--similar to western music's Sarah Brightman or Pavarotti. She even gained immense popularity in the west and attracted devotees like Bob Dylan. The music shares similarities to the operatic arias of western Baroque, Classical and Romantic opera. You can download mp3s of vocal classical Arabic music on the traditional page of MaqanMP3. This style of music is highly percussive, and it has a distinctive bowing and hammer string sound that might be compared in the west to Appalachian folk music with a fiddle and a hammer dulcimer playing along to the percussive patterns of a hand drum. You can download the mp3s of Iraqi maqam master Hamid Al Saadi for examples that include a vocalist. It requires tremendous skill to sing the microtonal inflections that this highly trained singer demonstrates. When it is sung in a space with reverb, the effect is beautiful and haunting. Western comparisons might be classical opera in its most virtuosic form or highly technical a capella (without accompaniment) music, such as the complex improvisation of gospel and jazz music. You can download free mp3s of one of the most famous reciters, Mishari Rashid al-`Afasy, at QuranicAudio. Mawwal, a style that came from Egypt, is traditional Arabic vocal music that serves as an introduction to the primary song being performed. This introductory vocal style became a genre and art form all its own. In this style, the instrument playing is sparse and is dominated by the vocal, almost to the point of being a capella. It's similar in structure and intent to the long vocal improvisations of a gospel or R&B artist who is singing a solo over little or no accompaniment. You can download a Mawwal podcast that explores the genre or download mp3s. This genre gathers the traditional styles of Tunisian and Andalousian Arabs and Jews, who moved from Spain to North Africa into a distinctive style, and it has a long history in Tunisia. Malouf features small ensembles with lute-like instruments, violins, percussion, and wind instruments that might remind the western listener of old Irish or Scottish music. The musical structure shares more similarities to western music than perhaps other Arabic genres--scales and chords that occasionally remind the listener of western sounds--which gives the music a distinct flavor. An anthology of malouf music is available on iTunes. A dance-oriented style inspired by Araband Berber Andalusian music, chaabi is a traditional music of Algiers (Algeria) that incorporates call and answer patterns into the vocals, often set against a high energy rhythm that is very easy (and fun) for dancing. It might remind the listener of high energy Brazilian dance music. An excellent sample of this style can be heard on the Espace Chaabi album. Mezwed is another form of traditional Tunisian music, and perhaps one of its most defining characteristics is its use of a bagpipe-like instrument called a mizwad. This distinct tone color will immediately remind western listeners of spirited Scottish bagpipe music. It is a very festive sounding music meant for weddings and parties. Hedi Habbouba is one of the most popular Mezwed artists who keeps the traditional forms alive by presenting them in a modern musical context. Samri, a form of traditional music and folk dance from the Najd in Saudi Arabia. It features male performers who sing poetry while seated on their knees playing the daff drum, clapping and swaying to the rhythmic patterns. The infectious and pulsating rhythm of the daff drum might remind western listeners of an acoustic version of heavy hip hop or techno beats or even African drumming. Khaliji, or Gulf music, is a melding of music from mostly central Arabia with African, Iranian, and Indian styles. It is a popular music form that shares the traits of Samri: heavy African-like rhythm with infectious beat, bagpipe-like instruments, and slightly different scales that reflect the mix of cultural influences. The music has found an incredible diversity of interpretation and influence in modern music. Some of the most successful examples of modern Arabic music, such as the legendary singer Fairuz, do not abandon the traditional styles, but they are able to bring traditional music influences into a new sound or interpretation that makes it widely appealing to modern audiences. One of the most famous Arabic singers of modern times, Lebanese singer Fairuz has enjoyed a stunning career since the 1940s. She is one of the first superstars of the music in modern times to not only become a legend in Arabic regions, but internationally as well. As this Harvard professor says about the legacy of Fairuz: "Quite simply, Fairuz is one of the world's nonpareil musicians and outstanding Artists, an international treasure of the order of Rostropovich, Sills, Ravi Shankar, Miles Davis, Sutherland, Pavarotti and Dylan." Fairuz has a wonderful gift for making traditional music alive and relevant in a modern music context, and her stunning voice has drawn kings and heads of state to her concerts. You can download mp3s of her beloved songs at MaqamMP3. Originally rooted in Algerian folk music, the fascinating genre of rai, which was born in the twentieth century and still alive today, mixes the old elements of the Bedouin music with modern flavors from France and Spain. In its earliest form, rai even resembled American folk and blues. In later decades, it adopted a pop sound. This early form of rai shows musicians playing western jazz instruments such as trumpets. Modern rai artists, such as Cheb Mami, have a more modern pop/rock sound and have collaborated with superstar western artists such as Sting. Originating in Egypt in the 1970s, Shaabi, captures an urban music of the late twentieth century with often political or humorous lyrical themes. It also expresses passion and intense, raw emotion with its singing style. Ahmed Adaweyah was the first famous shaabi singer, who sold a million copies with his first album in 1972. Kabylia is a folk music from Algeria, also comes from Algeria and was created by the Berbers and popularized by artists such as Slimane Azem. French music and western instruments such as banjos and guitars shaped the Kabylia style, and it functioned as protest music against French rule in Algeria. Popular artist Hakim is also an excellent example of the genre. Arabic rock music has become a popular genre across the Near East and North Africa, and it shares a similar stylistic structure but with all the melodic and rhythm traits of Arabic music placed in a rock band setting. The results can be a stunning and unique sound, as listeners hear in the famous rock artist Rachid Taha. You can download Rachid Taha tracks at his LastFM page. Arabic musicians are also venturing into jazz. One of the most talented Arabic jazz singers is Teema, who adds an elegant, beautifully tasteful Arabic influence to jazz vocal music that is reminiscent of Billie Holiday but with a gentle, haunting quality that is unique perhaps to Teema's Arabic roots. You can access a treasure trove of her best songs on Soundcloud. Arabic artists are creating superb albums in popular genres such as Arabic pop-infused electronic dance music. Artists such as Yasmine Hamdan have become big stars in the global music industry, and her music is making waves in the west as well, especially with head-turning tracks like her cover of "Stayin' Alive" as part of a collaboration under the artist name YAS. You can find her new album Al Jamilat on iTunes and other digital music venues. The long list of genres and artists featured above are just the beginning of what this music has to offer. The many traditions, stylistic layers, sub-genres, and mould-breaking new artists are dizzying in their variety, depth and quality.